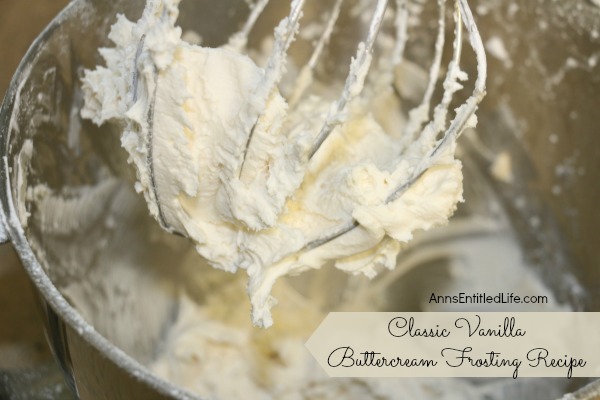 Classic, versatile, delicious vanilla buttercream frosting! The ideal frosting for cakes, cookies, cupcakes can be colored, sprinkled, piped and decorated to complete your sweet, perfectly. 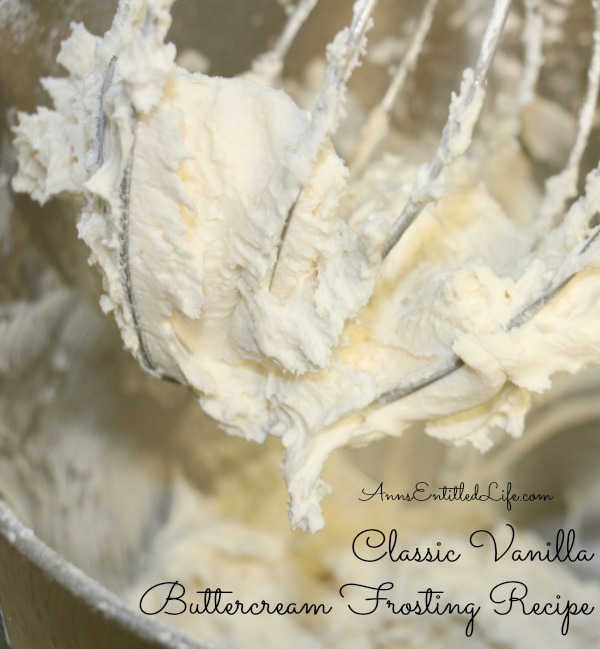 • With a stand-up mixer, beat butter until creamy on medium speed. • Gradually add half your confectioners sugar; beat until well mixed. • Add 1 tablespoon of milk; beat until well mixed. • Gradually add the rest of your confectioner sugar; beat until well mixed. • Add vanilla extract, and remaining milk. • Beat for 2 minutes. • Note: if you require a stiffer frosting, add more confections sugar in 1/2 cup increments. If you need a thinner frosting, add more milk in tablespoon increments. You can add a few drops of food coloring to make colored frosting. • Always frost completely cooled baked goods so your frosting does not melt on application. I love this frosting! Not only does it taste great, it is easy to work with. If it stiffens up on you, you can just beat it again a few times, or whip it aggressively with a spatula or fork. This is with 3 drops of yellow food coloring added. You can add just a few drops for a light color, or up to a dozen drops for a deeper color. This is great for frosting the entire cake, or for piping to decorate the cake. This recipe yields enough to generously frost a 13″x9″ cake, or double the recipe to generously frost a layer cake. 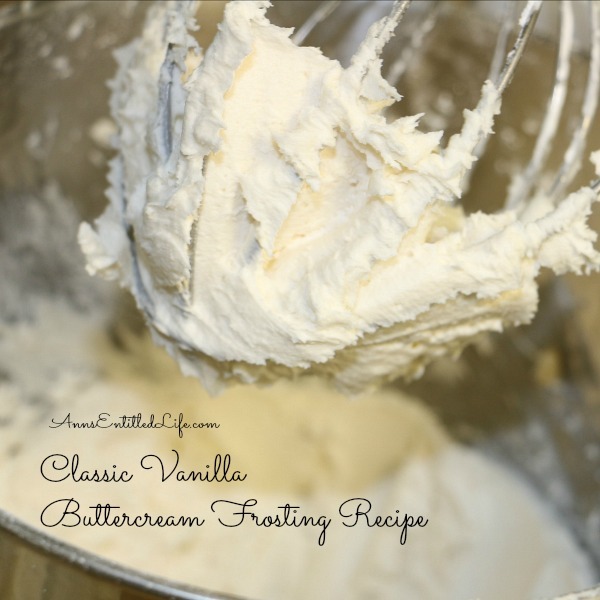 • To print the Classic Vanilla Buttercream Frosting recipe, click here. • Follow me on Pinterest! 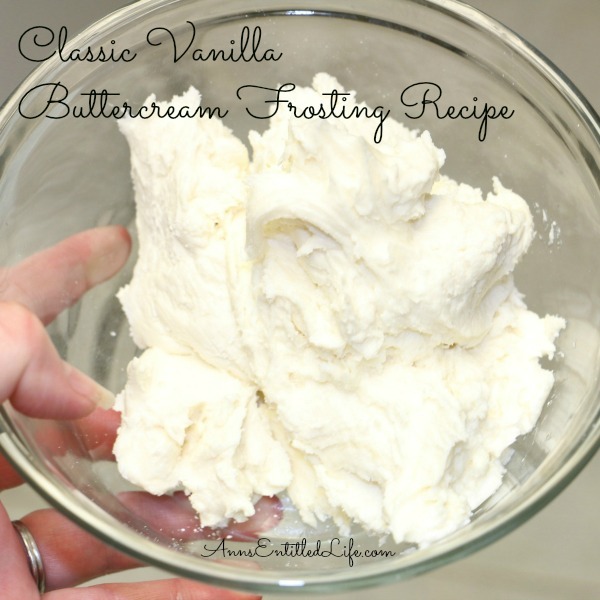 Don’t you wonder why people buy frosting when it is so easy and so much better? Is this type of buttercream also good for cake decorating vs using the Wilton buttercream recipe? Yes, Jenny. This is exactly the type of buttercream frosting you want to use for decorating. While I am not familiar with Wilton’s recipe, I am sure it is also very good for decorating… it is after all what they do. I do not like canned frosting! I sometimes use almond flavoring instead of vanilla. Really good. I made this one time it was so sweet it made my teeth hurt 🙁 never again!! While making this frosting.. Though using confectioners sugar and sifted twice , bits is sugar remain. I am glad you liked it, Jake! OMG…this is so rich and yummy! My daughter and I were licking the beaters clean after making this! I am so glad you both enjoyed it, Celine. I only needed a small amount of frosting to frost a batch of brownies. 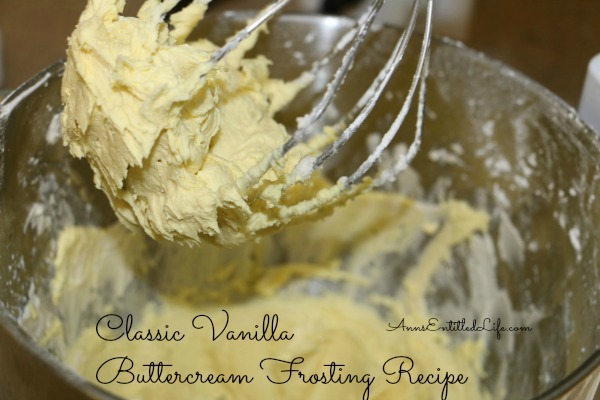 This recipe is very good tasting and I am glad it only uses butter. Thank you . try adding some powdered meringue!! !